And if you ask me, it's about flippin' time. Mom Neema delivered the healthy male calf at approximately 7:10 a.m. on Monday February 25 at the McGovern Giraffe Exhibit following a 14 month pregnancy. “The calf weighs 62 kilos, about 139 pounds and stands 74 inches tall,” said Houston Zoo Hoofed Stock Supervisor John Register. Neema is five and a half years old. The proud father, Mtembei is 6 years old. The Houston Zoo’s giraffe keepers who cared for Neema through her pregnancy have named the calf Yao in honor of former Houston Rockets player Yao Ming. Working with the conservation organization WildAid, Yao Ming has led the world’s largest conservation awareness program spotlighting illegal elephant and rhino poaching in Africa and the shark fin trade in Asia. 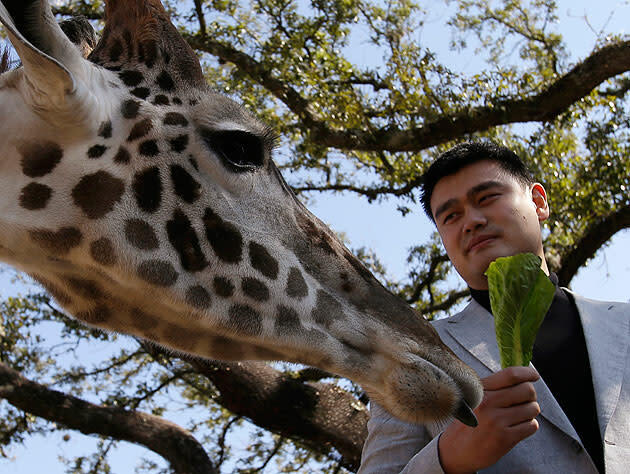 Yao toured the Zoo’s giraffe, rhino and elephant exhibits on February 14 with a group of Pasadena ISD middle school students prior to the NBA All Star game at Toyota Center. We've talked about the retired NBA star's work with WildAid to curb elephant and rhino poaching, as well as his vocal support for the fight to ban shark fin soup before — Yao is a legitimate conservationist and humanitarian, someone intent on using his status as one of the world's most famous and noteworthy public figures to try to save the lives of animals. He is awesome, and his work is awesome. That he has been recognized for it by having a baby giraffe named after him is ... wait for it ... awesome. Everything about this is my favorite, including the fact that two years after his retirement, there is once again a giant male named Yao walking around. Also, I am not at liberty to embed them here, but please enjoy a full Flickr set and slideshow of Baby Yao Ming The Giraffe, courtesy of the Houston Zoo and with my compliments. It's been a long day. You deserve it. Hat-tip to Zooborns, which is the best thing I've gotten to write today, by way of Kirk Henderson.